Days are longer and brighter again and we’ve spotted the first signs of spring in our garden and around town. Daffodils, crocuses and snowdrops and are peeking up towards the sun here and there, and everything bursts of hope once again. Happiness! I just popped by today to share the latest version of an old favorite recipe of mine. 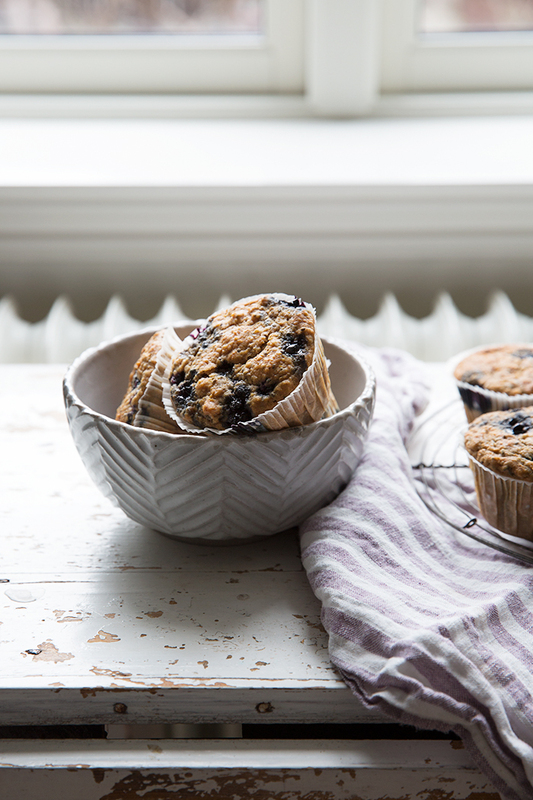 I’ve made several versions of these muffins, using different fruit and berries each season – or frozen any time of the year. But this time I wanted to make an even healthier muffin for breakfast and snack purposes. I think this is the best version ever. 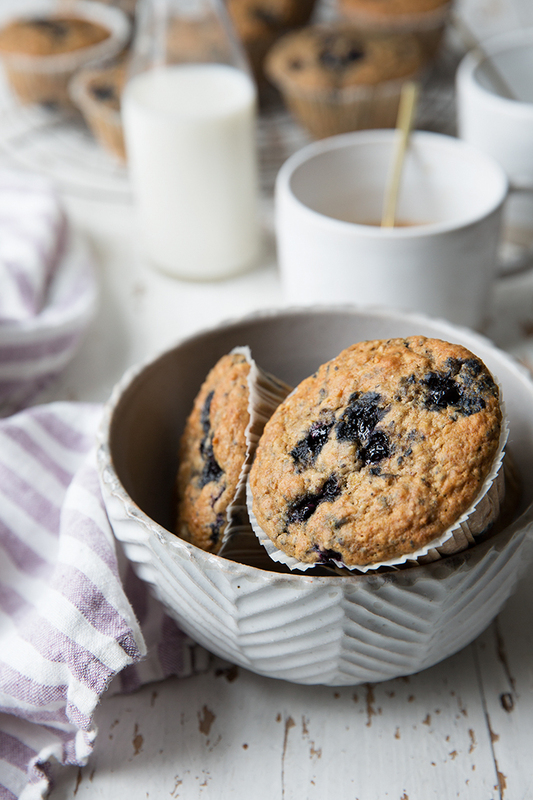 Lightly sweetened with coconut sugar, and with the grainy goodness from wholegrain spelt and oats, these muffins are the perfect companion for a long lazy breakfast or a fast snack on the go. 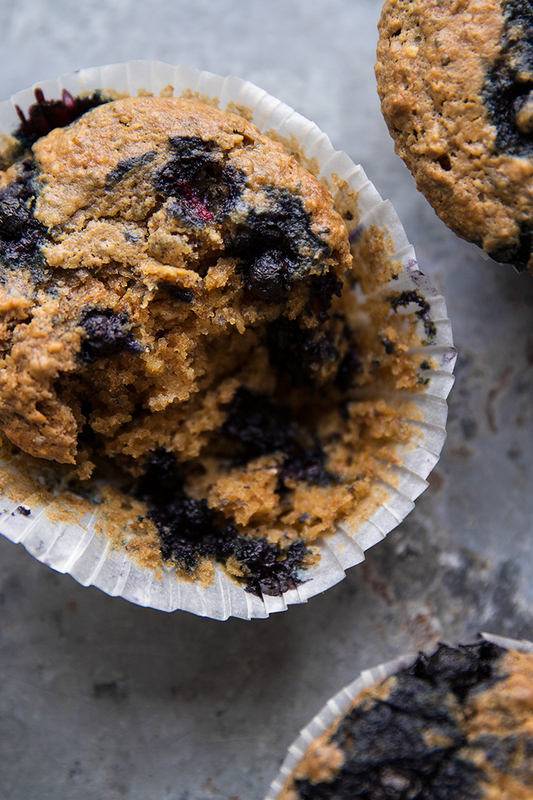 And the addition of grated parsnip, frozen blueberries and coconut oil result in a super moist and fragrant muffin you won’t be able to resist. I have never been a huge fan of so called “super-foods” from countries far away. I think we should all try to use ingredients sourced as close as possible to where we live. But I really wanted to give maca powder a try when I was told it can actually reduce PMS, and now I add it everyday to my smoothies (it’s especially good with cacao!) hoping for good results in that area. And this is my first attempt to use it in baking, realizing it actually adds an interesting earthiness that goes very well with the parsnip. This recipe contains both chia seeds and maca powder for that extra power boost, but you can omit both if you like. 1) Preheat the oven to 180° C (360° F). First whiz the oats in a food processor or blender a few seconds until almost flour-like. In a large bowl mix all the dry ingredients. 2) Place the coconut sugar, yoghurt, coconut oil, grated parsnip, lemon zest and eggs in a second bowl and beat until well blended. 3) Add the egg mixture to the flour with the blueberries. Use a rubber spatula to fold together gently until just combined. Do not overmix. 4) Line a 12-cup muffin tin with paper cups and divide the mixture among the muffin cups. 5) Bake 15-20 minutes or until a toothpick inserted into the muffins comes out clean. Leave the muffins in the tin for 5 minutes before removing. These are best the day they’re made or the day after, but you can freeze any leftovers and thaw at room temperature about an hour before eating. Loved these muffins when I first saw them on instagram, so thanks for sharing.